The University of Pennsylvania’s Global “Go-To Think Tanks”-Report 2013 lists BICC (Bonn International Center for Conversion) again in two categories amongst the leading think tanks worldwide. 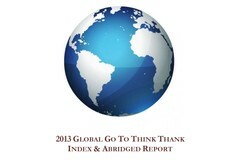 The ranking is based on an analysis of 6,826 think tanks from 182 countries. 1,947 experts from around the world, across the political spectrum and from every discipline and sector helped nominate and select public policy research centers of excellence. The Global “Go-To Think Tanks”-Report nominates BICC on the one hand amongst the TOP 100 Think Tanks Worldwide (Non-US) and on the other amongst the TOP 150 Think Tanks Worldwide (US and Non-US). “We are very pleased that the ranking acknowledges the new concept of Conversion Studies that BICC introduced in 2013. It encourages us to intensify our research on conversion and the critical and policy relevant discourse on dynamics of organized violence,” stresses Professor Conrad Schetter, Director of Research at BICC. According to its editors the Index has become the gold standard for think tanks around the world and is widely cited by governments, donors, journals and policymakers as the foremost profile and performance of think tanks in every region of the world. To complement this global expansion, regional events took place in over 30 global cities to announce the report, which was translated into 13 languages including Arabic, Chinese, French, German, Hebrew, Hindi, Italian, Japanese, Korean, Polish, Portuguese, Spanish and Turkish. In April 2014, BICC will celebrate its 20th anniversary. It was founded in 1994 with the support of the State of North Rhine-Westphalia (NRW) as a non-profit limited liability company (GmbH) and has since been supported by the State. BICC deals with a wide range of global topics in the ﬁeld of peace and conﬂict research centering on Conversion Studies. Its research focus lies on concepts, means and practices of organized violence as well as natural resources and migration. These topics complement each other and offer multiple thematic and methodological synergies. As an independent, non-profit organization, BICC conducts research on conversion for a more peaceful world.